The Lufthansa Orchester presents Sky Classics, a concert featuring classics and well-known themes. Sixty-five musicians will travel from Germany especially to perform in Malta. All musicians have diverse careers and include pilots, cabin crew, engineers, mechanics, finance executives, project managers and professional musicians amongst others. They join forces in this unique orchestra and it is their love for music that unites them all. 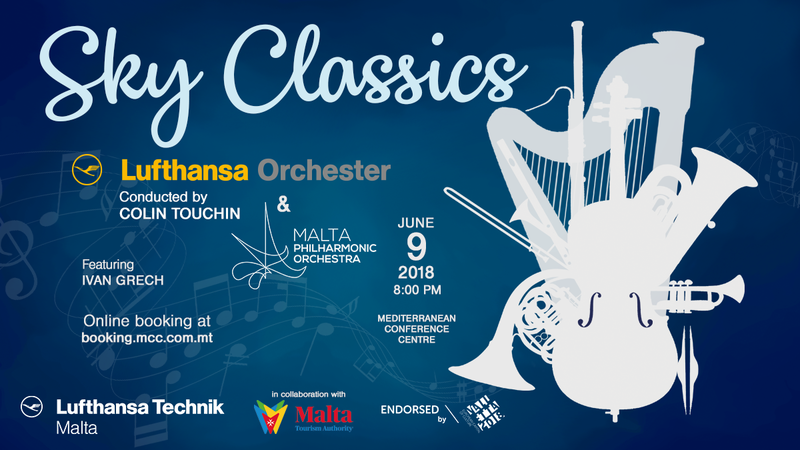 To make this night even more memorable, they will be joined on stage by local singer Ivan Grech and the Malta Philharmonic Orchestra (MPO). The evening’s musical programme shall include the most popular Beethoven 5th Symphony 1st Movement, Slavonic Dance (Gm) by Brahms, Pirates of the Caribbean theme, themes from James Bond, and much more. Ivan Grech will entertain the audience with a selection of songs that will surely have you singing away with us at this unique event. Sky Classics is endorsed by the Valletta 2018 Foundation and will be held at the Mediterranean Conference Centre in Valletta on the 9th June.